This entry was posted on January 31, 2017 by Jessica Anderson. Each year, the staff at Trophies2Go nominates and then votes on a Supplier of the Year, Product of the Year, and Customer of the Year. Congrats to our 2016 'Customer of the Year'! 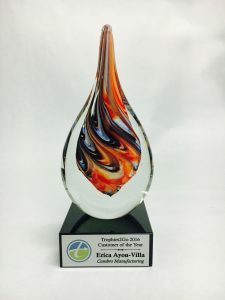 Today's blog post celebrates the winner of 'Trophies2Go's 2016 Customer of the Year', Erica Ayou-Villa from Cambro Manufacturing! Based in California, Erica is our first Customer of the Year winner who orders from us exclusively online, as all other past winners have been local customers from the Seattle area. Erica was nominated by our Customer Service/Engraver Mike, who said: "Erica is easy to work with and accepting of our ideas. She is realistic on time frames for special products and is organized about the information she sends to us." Also our Laser Engraver/Graphic Artist Lori commented about Erica: "She has been ordering from us for quite a while; she is easy to work with and very agreeable!" We supply Cambro's Super Star Sales Awards, including award plaques, acrylic awards, and art glass awards. Thank you Erica and Cambro Manufacturing for being an outstanding Trophies2Go customer!